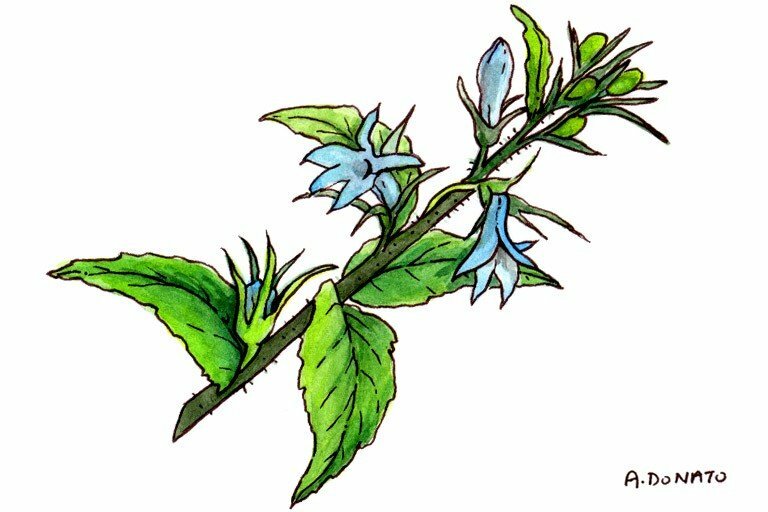 Current evidence shows that lobelia is not effective for smoking cessation, asthma, or any other medical condition. The active compound in lobelia is lobeline. Lobeline has a similar activity in the body to nicotine, which explains its common use as an aid in smoking cessation. Like nicotine, lobelia stimulates the central nervous system (CNS), dilates lung passageways, and increases respiration rate. However, at higher doses, lobelia has the opposite effect and causes CNS depression and reduced breathing rate. In experiments with rats and mice, lobeline increased the release of stimulatory neurotransmitters dopamine and norepinephrine from specific parts of the brain, but it is still unclear what significance this has in the human body. Strangely, lobeline can have both additive and opposing effects when used at the same time as nicotine. Although lobelia is thought to dilate the bronchial tubes, human data are lacking. Lobelia causes release of excitatory neurotransmitters in the brains of research animals. Human studies are needed. There is no research to back this claim. A review of 16 clinical trials concluded that this herb is not effective for smoking cessation. You are using nicotine-containing products: Lobelia may have additive effects, resulting in toxicity. Derived from the aerial parts of the plant, patients use lobelia for smoking cessation and to treat asthma and depression. Piperidine alkaloids are thought responsible for lobelia’s activity. In vitro and animal studies show that lobeline crosses the blood-brain barrier, has activity similar to that of nicotine, and stimulates the release of dopamine and norepinephrine (5). At low doses lobelia has stimulant effects, but higher doses result in CNS depression (10). Lobeline, a piperidine alkaloid, was shown to reverse multidrug resistance of tumor cells to doxorubicin (16), reduce alcohol consumption (17), and exert antidepressant effects (19) in mice. Clinical studies of lobelia do not support its use for smoking cessation (15) (18) (20). Lobelia has central stimulant activity, dilates bronchioles, and increases respiration rate at low doses, but higher doses cause CNS and respiratory depression (10). In vitro, lobeline redistributes dopamine pools in presynaptic vesicles and antagonizes their release following amphetamine stimulation. Lobeline can have both antagonistic and synergistic effects when combined with nicotine and does not induce receptor upregulation as seen with nicotine (10). In rodent models, lobeline increases dopamine release from striatal synaptosomes, increases norepinephrine release from the hippocampus (5), and binds extensively to nicotinic receptors both centrally and peripherally (4). Other animal studies suggest that beta-amyrin palmitate stimulates the release of norepinephrine in the brain, possibly leading to an antidepressant effect (1). Intravenous administration of approximately 12 mcg/kg lobeline to healthy human subjects resulted in cough, apnea, prolonged inspiration and expiratory pause, the feeling of choking, and pressure in the throat and chest (9). Nicotine-containing products: Lobelia may have additive effects, resulting in toxicity. Subarnas A, et al. A possible mechanism of antidepressant activity of beta-amyrin palmitate isolated from lobelia inflata leaves in the forced swimming test. Life Sci 1993;52:289-96. Damaj MI, et al. Pharmacology of lobeline, a nicotinic receptor ligand. J Pharmacol Exp Ther 1997;282:410-9. Santha E, et al. Multiple cellular mechanisms mediate the effect of lobeline on the release of norepinephrine. J Pharmacol Exp Ther 2000;294:302-7. Miller DK, et al. Lobeline inhibits the neurochemical and behavioral effects of amphetamine. J Pharmacol Exp Ther 2001;296:1023-34. Decker MW, Majchrzak MJ, Arneric SP. Effects of lobeline, a nicotinic receptor agonist, on learning and memory. Pharmacol Biochem Behav 1993;45:571-6. Subarnas A, et al. An antidepressant principle of Lobelia inflata L. (Campanulaceae). J Pharm Sci 1992;81:620-1. Raj H, et al. Sensory origin of lobeline-induced sensations: a correlative study in man and cat. J Physiol 1995;482:235-46. Terry AV Jr, et al. Lobeline and structurally simplified analogs exhibit differential agonist activity and sensitivity to antagonist blockade when compared to nicotine. Neuropharmacology 1998;37:93-102. Reavill C, et al. Behavioural and pharmacokinetic studies on nicotine, cytisine and lobeline. Neuropharmacology 1990;29:619-24. Dwoskin LP, Crooks PA. A novel mechanism of action and potential use for lobeline as a treatment for psychostimulant abuse. Biochem Pharmacol 2002;63:89-98. McChargue DE, Collins FL Jr, Cohen LM. Effect of non-nicotinic moist snuff replacement and lobeline on withdrawal symptoms during 48-h smokeless tobacco deprivation. Nicotine Tob Res 2002;4:195-200. Stead LF, Hughes JR. Lobeline for smoking cessation. Cochrane Database Syst Rev 2002;(2):CD000124. Ma Y, Wink M. Lobeline, a piperidine alkaloid from Lobelia can reverse P-gp dependent multidrug resistance in tumor cells. Phytomedicine. 2008 Sep;15(9):754-8. Farook JM, Lewis B, Gaddis JG, Littleton JM, Barron S. Lobeline, a nicotinic partial agonist attenuates alcohol consumption and preference in male C57BL/6J mice. Physiol Behav. 2009 Jun 22;97(3-4):503-6. Glover ED, Rath JM, Sharma E, et al. A multicenter phase 3 trial of lobeline sulfate for smoking cessation. Am J Health Behav. 2010 Jan-Feb;34(1):101-9. Stead LF, Hughes JR. Lobeline for smoking cessation. Cochrane Database Syst Rev. 2012 Feb 15;2:CD000124.